I wanted to start this blog to educate Brides about lighting. Education is the first step to knowing what you want and why you want it. I did come from a long line of teachers and this is dedicated to my family who taught me so much. I enjoying helping people, making them happy, and sharing my lighting secrets. At the end of the day we should have exactly what we want. You will have a beautiful wedding and I will have that perfect picture from your amazing wedding for our web page. 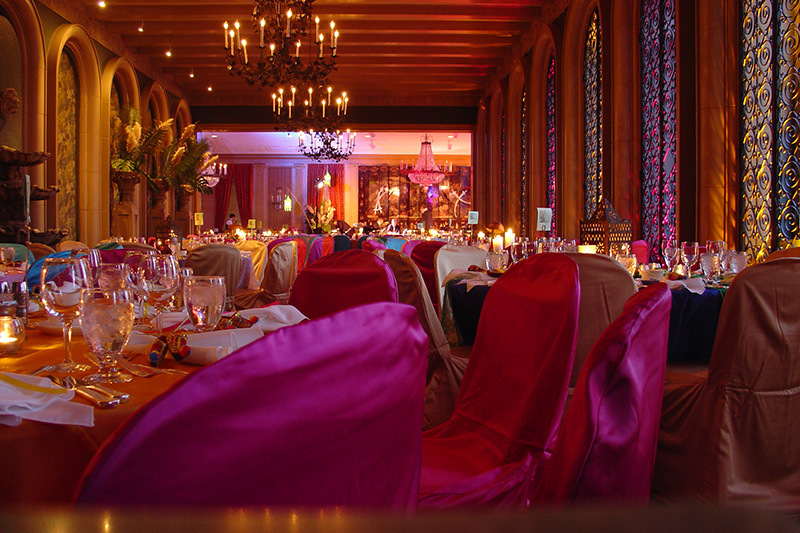 For your best design the lighting person must be able to quickly assess how to light the room the best way possible. The other day I was looking at a photograph from another wedding planner at the Fort Worth Club. I notice 2 very bad errors with the way they had lit the room. First in the picture at the brides feet bride was a big ugly black colored light right in the middle of the mirrored hall way. You can’t use a block type Led in this situation. We have slender models for hallways and tight places. Someone could trip or turn a heel on a light on the floor. Things they could of done to fix that?… Put a plant there so people will be less likely to trip over the light. Or we at this location, put the lighting inside the metal window grates. This has a two fold purpose, one it is safer for the guest and you don’t need the plants. But the best thing about this is that to properly light this room you must accent the architecture of the room. Look at the picture and how lighting the grate makes the right side of the picture more interesting. I want my Bride to have the best this room has to offer. The entrance of this room has many metal grated that cover the windows the are really beautiful if you light them with heavy color. This room is lit with uplights pink and gold. This is the way to light this room and it is affordable. Check out our gallery for more ideas.